If the previous post was the “before” pic of Christmas dinner, then I guess this would have to be the “after” pic. 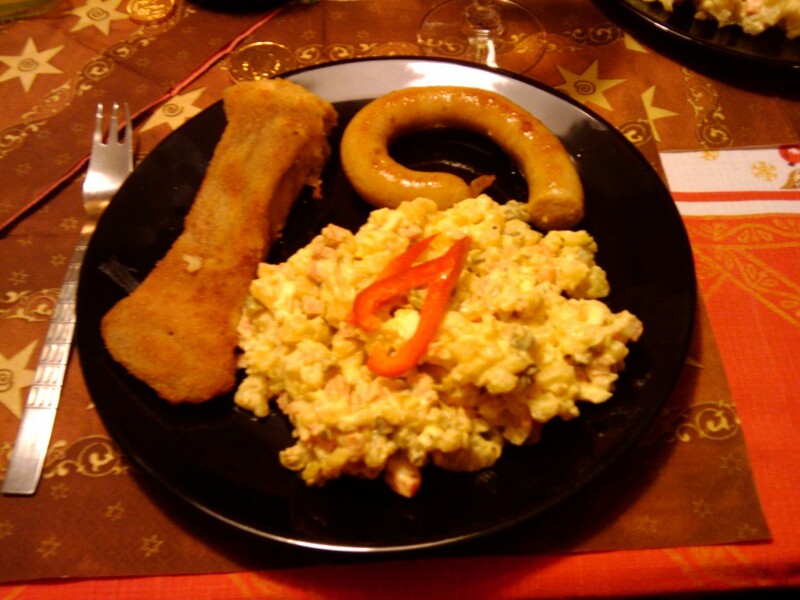 So here it is the real deal, Christmas dinner ala Ren’s mum, sausage, a mountain of potato salad… and yup the schnitzel type affair that is the Carp from the bath in the previous post… and it was delicious! Despite a number of threats I managed to dodge the honour that is slaughtering and gutting them, (the slaughter process consists of a steak mallet round the head followed by a swift beheading… for the fish… obviously! ), although I avoided being the knife man I did end up having to peel and fillet one of them, which would have been slightly more pleasent had I not got horendously drunk the night before and woken up with a rather sensitive stomach… but unlike the fish’s mine stayed in! Unfortunately the pics are too big to upload to wordpress so I have uploaded them to picasa… my personal favourite is the one of the “peelings” that I managed to remove in one piece. After dinner we all politely sat round the table and waited for santa to come in through the living room window, drop off the presents under the tree, and then leave, (obviously in Nottingham Santa would leave with more presents than he came in with… assuming he could get through all the window bars!). Strangely for yet another year as we waited to hear the jingling of sleigh bells leaving Ren’s dad was once again nowhere to be seen… I do feel sorry him he hasn’t experienced the feeling of Santa coming since he had kids, coincidence… I’ll let you decide?! So after such a lovely, productive, and murderous day what could go wrong, Christmas dinner has gone from swimming around the bathtub to the plate, Santa has delivered presents for all, and sufficient sparkling wine has been drunk to get everyone merry… surely the perfect Christmas for all, I even received my dream present of a Wii (purely for fitness reasons, what other reason could a 32 year old want a games console for! ), so all peachy then… right up to the point when I try and plug in my new Wii to the… shall we say not exactly state of the art TV… so anyway it’s the thought that counts, and I have every confidence that the Wii will work… once we get home on Monday and plug it in to our TV… at least that’s what I think, and it is after all the thought that counts! This entry was posted on December 25, 2009 at 12:47 pm. You can follow any responses to this entry through the RSS 2.0 feed. Both comments and pings are currently closed. 2 Responses to "Batteries not included!" Wow Steve another great post! So pleased you are using your blog and Picasa 🙂 You will be able play against Sally & Nick on your wii.